Brian Hamilton is worried. The cofounder and CEO of Sageworks, a financial information firm, says he’s concerned that private companies—the nation’s job creators, which drive 65 percent of new positions—are clamping down on hiring. And that’s only going to mean that eventually profits will go down, he said. Hamilton’s data paint a dire picture. 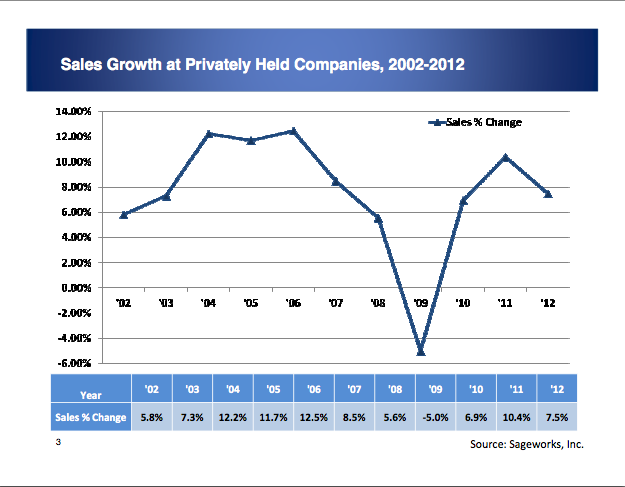 Sales growth at the nation’s 27 million private companies has slowed from 11 percent in January to 8 percent in June. It’s now at 5.4 percent. This bodes badly for the nation’s workforce, he said Thursday during an event at the Harvard Club in New York City. “We’re already experiencing a jobless recovery. If business owners weren’t hiring when their revenues were growing at 8 and 11 percent, what will they do at 5 percent?” Hamilton asked. He’s not alone in his concerns. The Intuit Small Business Monitor, released Monday, shows that hiring at the small business level continues to be anemic. Small- and midsize businesses (SMBs) added 40,000 new jobs in September, a mere 0.2 percent increase from the previous month. Speaking about that figure, economist Susan Woodward pointed to good news and bad news. “Small-business employment is growing very slowly and is essentially flat. Couple that with the slow employment growth of less than one tenth of a percent for big businesses, and we see a slim chance of full employment anytime soon. “The good news is that more people are going into business for themselves. After five years of declining self-employment beginning in January 2007, we began seeing a big comeback starting in November 2011. Nearly 600,000 additional self-employed folks have been added since then, and there are now 14.2 million people who are self-employed,” Woodward said. But even with entrepreneurship on the rise, will those startup founders go out and hire some of the millions of Americans who still need work? Hamilton isn’t sure. “There’s real anxiety from these business owners and companies about the state of their business,” he said. And Hamilton’s perplexed by that. Because when Sageworks, which is based in Raleigh, North Carolina, crunches another key economic indicator—net profit margin—it sees an upward trend: an increase from 4.3 percent in 2010 to 5.3 percent in 2011 to 5.3 in 2012. Projections for 2013 show net profit margins hovering at 9 percent. So why all the gloom and doom? So why are business owners nervous? During the Harvard Club event, Hamilton and Mark Jaffe, president of the Greater New York Chamber of Commerce, didn’t get into their views on policy such as health care reform or lending practices. But they pointed to ongoing debates that make for “an environment that is so poisonous” in Washington that it doesn’t encourage a business owner to hire. Add to that the burden of operating under an umbrella of a $17 trillion national debt, and it just might give you pause in the hiring process. American business owners saw many great, established companies failed during the Great Recession because they didn’t assess their risk conservatively enough. They don’t want to fall victim to the same folly. Jaffe said the best way to guard against failure is to make sure that you cover your fundamentals. “Do you have a product or a service that someone will pay for? Are people coming back and purchasing again?” Don’t be afraid to work out of your kitchen, home, garage,” Jaffe said. “Some of America’s greatest businesses started that way and grew to become enterprises like Mrs. Field’s Cookies, HP, and Apple that we know today. And they employ thousands of people.